Last month, GS1 US published a report on a DSCSA barcode assessment they conducted last year with two of the largest wholesale distributors in the US, AmerisourceBergen and McKesson. 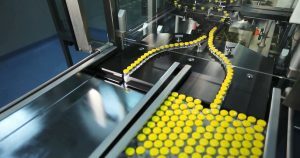 The goal of the assessment was to take a “snapshot” of pharmaceutical manufacturer progress toward meeting the serialization requirement of the Drug Supply Chain Security Act (DSCSA) by analyzing drug packages actually in the market. Data was collected by teams who inspected the majority of the prescription drug products in one of McKesson’s pharmaceutical distribution centers, and all of the products in AmerisourceBergen’s specialty drug distribution center. Between the two wholesale distributors, 16,618 drug products were inspected, representing 607 different drug manufacturers. This is the most comprehensive DSCSA barcode assessment conducted to date. The data collection teams noted the type of barcodes on each product and any distinguishing characteristics that might impact readability, and then they attempted to read the barcodes found. What they found was revealing. At that time (May 2017) only about 15% of the packages inspected had a 2D barcode on them, indicating an attempt by the manufacturer to meet the DSCSA requirements. Of the packages that had a 2D barcode, less than half of those were readable, and contained all four of data elements required to meet the DSCSA. Those data elements include the NDC, serial number, expiration date and lot number. GS1 US and Systech recently conducted a webinar to present the assessment and discuss solutions to the problems found. Watch the webinar on demand and get the presentation here. GS1 US plans to conduct a follow-up assessment later this spring for comparison. To download the current report click here. 2019 Systech International. All rights reserved.